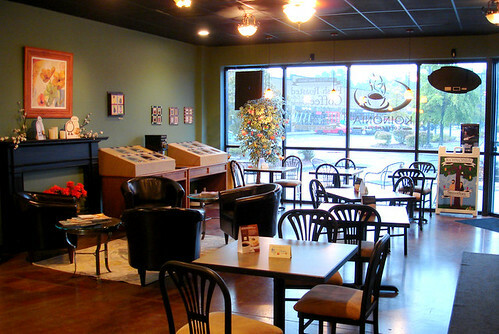 You will find Koinonia Coffee House tucked away in a strip mall just off South Miami Boulevard in the RTP area of Durham. 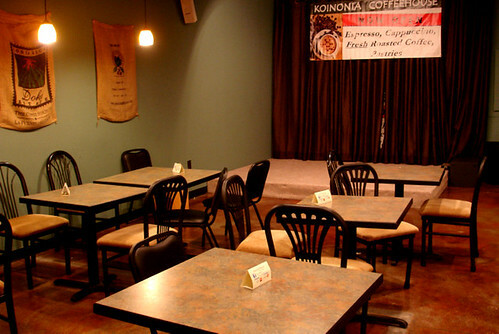 Koinonia is one of the latest additions to the growing Triangle coffee scene having only opened its doors a little less than a year ago (December 2012). I stopped by a few weeks ago before the morning rush and found it to be a great place to relax with some great coffee and get some work done. I like local businesses that use local products, so I was pleased to learn they use locally roasted Joe Van Gogh coffee beans at Koinonia. 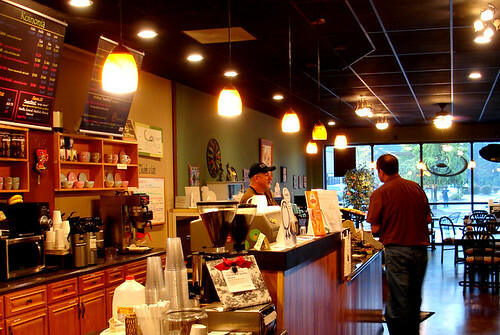 They make a variety of coffee and espresso signature drinks (I love lattes made with Joe Van Gogh espresso beans). They also have a nice glass case filled with locally made baked goods and pastries like Cakes by Faith and Sweet Jane’s. 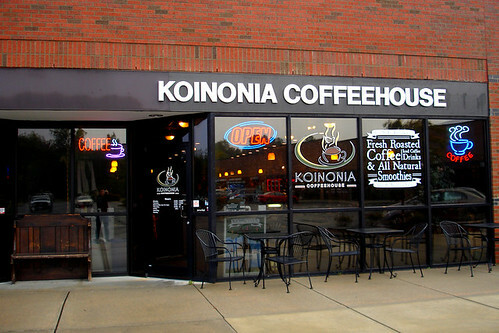 In Greek Koinonia means “community” or “fellowship” and that is what this coffee house strives to provide. 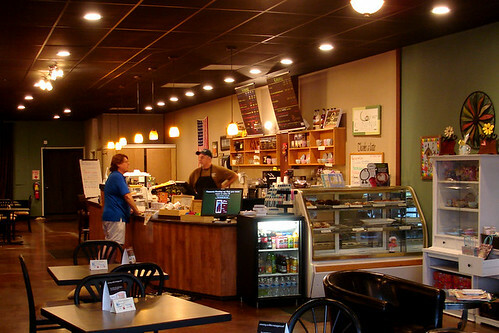 It is a great space for meeting people and can accommodate larger groups or meetups. 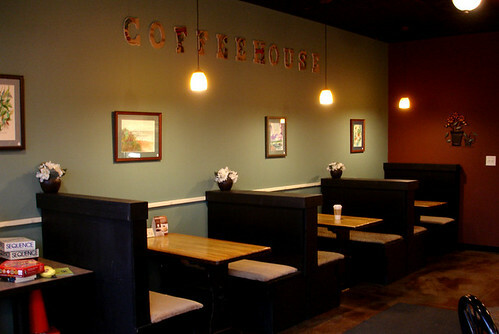 It occupies a relatively large space with ample seating options ranging from tables for two, comfy chairs, and booths for larger groups. There is a blossoming music scene developing at Koinonia. Every Wednesday they hold an Open-Mic night from 8 – 10 PM. There is a small 10′ x 8′ stage set up in the back of the shop along with a sound system that can easily accommodate a solo artist or small group setups. They also regularly feature live music on Friday and Saturday nights. Check out their facebook page for updates on the music schedule. 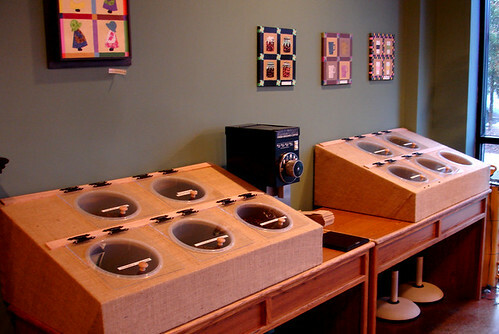 There is a nice display that the owners built that features ten different types of Joe Van Gogh coffee beans that you can weigh out and purchase. They even have a grinder you can use if you don’t have one at home. I love that you can buy loose coffee beans since it allows you to buy in any portion size you want allowing for easy experimentation without committing to buying a full pound of coffee beans. In addition to all their coffee offerings the shop also makes a full line of fruit smoothies made with fruit mixes from Sweet Bird Smoothie mix. All of the Sweetbird Smoothies are free from high fructose corn syrup, artificial colors, flavors and preservatives and genetically modified ingredients. I didn’t have a chance to try a smoothie during my visit, but I hope to get one when I go back. On December 14th the shop will host a special Christmas Program with live music from the Bethesda Bluegrass Band and McLamb, Mullen & Preddy. Tickets are FREE but need to be picked up prior to the event.